There are plenty of ways you can participate in the celebration of World Wildlife Day. In the past, countries and people around the world have observed the day in various ways. Some activities are big and others are small, but all of them have helped promote awareness about wildlife conservation issues. Get to know marine species and the challenges they are facing and how you can help. Share what you've learned with your friends and family. Post on social media and spread the word. Have a look at our Social Media Kit if you need some inspirations. Take a photo with the action card and say something about the day. ​And do follow the official Twitter, Facebook and Instagram accounts of World Wildlife Day. Bring World Wildlife Day to the class and talk to students about the day. The youth are the future leaders of wildlife conservation and they deserve a future where we humans live in harmony with wildlife that share the planet with us. Organize or enter a competition! It can take many forms, for examples, an art competition, a photo competition, a speech competition on big cats protection, or why not a World Wildlife Day marathon? Take the World Wildlife Day to the street, and raise awareness about wildlife protection and engage with people through role plays, billboards and street parade. Give awards to rangers and law enforcement officers who fight for wildlife everyday on the frontline as well as youth conservation leaders. Launch a new campaign linked to World Wildlife Day – make it specific to a local issue or species! Organize a talk show, a presentation or discussions at your local school or university on big cats conservation. Collect signatures for a “say ‘no’ to illegal wildlife products” campaign. Set up a wildlife exhibition for education and awareness building following the theme of the year when possible. Organize wildlife awareness contest and give awards to the winners. Visit your local zoo, wildlife park, museum, botanical gardens or national park. Collaborate with local zoos, aquariums or museums and encourage them to celebrate World Wildlife Day – suggest entry by donation on that day! 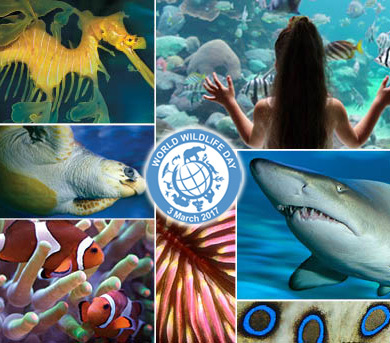 Our partners such as World Association of Zoos and Aquariums (WAZA) are encouraging their members to celebrate the day. Use your talent to show your support to the conservation of big cats and inspire the world. Donate to your local conservation projects. Remember, donations are not always financial! Hold a screening of wildlife films. Interested in hosting the screening of the winning film of this year's International Big Cats Film Festival? Check out this page. Have Fun! – your own creativity is the only limit! Set a Goal - Live your daily life with the smallest negative impact on the environment, wildlife and their habitats. Mobilise - Encourage local schools, clubs, governments and businesses to discuss wildlife conservation and what you and your community can do to help. Visit - Aquariums, botanical gardens, national parks and nature reserves. Research holiday destinations and countries that work hard to protect wildlife and habitats. Consume Responsibly- By not purchasing products made from illegally sourced protected wildlife or their parts and products, you can stop wildlife trafficking from being a profitable enterprise. More information can be found through your national or local wildlife authorities or the Convention on International Trade in Endangered Species or Wild fauna and Flora (CITES).